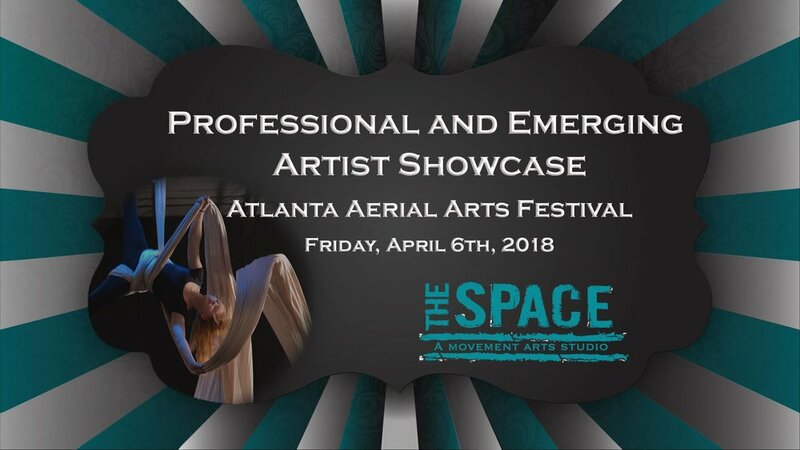 UpSwing will perform in the Atlanta Aerial Arts Festival Showcase on April 6th our new aerial piece "Origin of Happiness". It is a rope & harness duet where two dancers must find a balance in their relationship while being suspended from a single rope & pulley. Performed by Helen Fitanides and Alissa Kaplan. For tix go here. On April 7th, UpSwing Artistic Director, Cherie Carson, will teach with UpSwing Company dancers, Helen Fitanides & Alissa Kaplan, a rope and harness workshop called "Dynamic Duo". This is a rope & harness workshop that explores variation & contrast in force & intensity, balance & counter-balance while working with a partner. Do not have to sign up with a partner to participate. Class will cover equipment safety, warm up and skills. Please bring your own harness if you have one. Imagine different floating movements, twirls, swings in every plane of motion —the possibilities are endless. Aerial rope & harness dancing is based on harnessing energy when the rope is moved away from the plumb line. The body accesses energy through circular or pendulum forces, balances and your imagination. It is super fun! March 21-25 - Cherie Carson, UpSwing Artistic Director, is guest teacher in the 2016 Santa Barbara Floor to Air Festival, Sunday, March 13 thru Friday, March 25. Floor the Air Festival celebrates the contemporary and boundary-pushing genre of aerial dance. The first festival in California to highlight the organic relationship between floor and air movement, FAF unites professionals, students, spectators, and supporters for a one week professional artist residency and collaboration, four days of exclusive workshops in a multitude of approaches, intimate soirees, and a culmination performance and gala at the historic Lobero Theatre. Company members will also be in attendance. For more information, to register to take the workshops go to 2016 Santa Barbara Floor to Air Festival. Cherie teaches aerial rope and harness workshop in which upper body strength is not required. Develop core strength the fun way as you learn to flip, swing and circle while dancing in the air. Workshop covers basics of equipment safety, warm up and skills. Please bring your own harness if you have one. Imagine different floating movements, twirls, swings in every plane of motion —the possibilities are endless. Aerial and Harness dancing is based on harnessing energy when the rope is moved away from the plumb line. The body accesses energy through circular or pendulum forces, balances and your imagination. No experience necessary. “Look Ma No Hands” is an aerial rope and harness workshop in which upper body strength is not required. Develop core strength the fun way as you learn to flip, swing and circle while dancing in the air. Class will cover basics of equipment safety, warm up and skills. Please bring your own harness if you have one. Imagine different floating movements, twirls, swings in every plane of motion —the possibilities are endless. Aerial Harness dancing is based on harnessing energy when the rope is moved away from the plumb line. The body accesses energy through circular or pendulum forces, balances and your imagination. A teaser concert performed by professional aerialists from across the globe kicks off the festival on Friday and Saturday evening, July 18-19, 2014, at 8:00 PM. The Festival closes with an informal showing of works by workshop participants on July 26, 2014, at 8:00 PM. This year’s festival features classes and performances by Cherie Carson /UpSwing Aerial Dance Company (California) – Workshop on Sunday, July 20 only, Lee Claydon (Ireland), Liz Cooper (Canada), Molly Graves (Tennessee) and Rachel Strickland (California). Elizabeth and Cara performing "Snowbirds"
July 28, 29: UpSwing invited as guest performers at Open Air Festival, Vashon, WA. Ashley and Kiran performing "Inside the Circle"
Dec 2 & 3: Manhattan Movement Arts Center, NY - performing "Inside the Circle"
Nov 29: Laguardia Performing Arts Center, NY - performing "Inside the Circle"